Originally developed as a response to a memo issued by the White House Office of Science and Technology Policy, the CHORUS service leverages existing infrastructure to help with the access, compliance, discovery and preservation of peer reviewed articles. 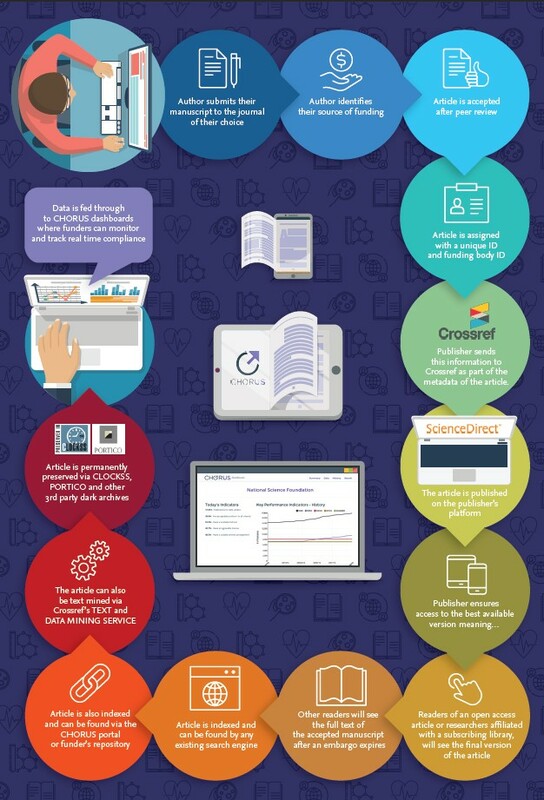 Elsevier is a founding member of CHORUS and along with fellow publishers actively developed and piloted the CHORUS service to provide a low cost compliance service for open access. CHORUS utilizes publishers’ infrastructure for access to full-text and partners with dark archives CLOCKSS and Portico to ensure, long-term preservation of scientific and medical research. It also provides participating funders and institutions with dashboard reporting in order to monitor and track compliance. In practice, this means we host the open manuscript on ScienceDirect, making these publicly accessible after the embargo period expires. We are also providing free Scopus access to pilot universities. What journal version is hosted and when can this be accessed on ScienceDirect? Access will be to the author manuscript version of an article after the journal specific embargo period. If a user is affiliated with a subscribing institution they will see the final version of the article, the best available version and not the author manuscript. Do all Elsevier journals have an embargo period? Where do you find a list? Yes, all Elsevier journals have a standard embargo period. The full list is hosted on Elsevier.com. We also have an journal embargo finder tool available here. Please note there are some funding body exceptions where shorter embargo periods apply. Please see our agreements section. How can the manuscripts Elsevier is making available on ScienceDirect for CHORUS be reused? The download version can be used under the terms of the Elsevier user license. A comparison of licenses can be found on our open access license page. How can an author tell if their manuscript is available through CHORUS? Authors funded by the US Department of Energy and the Smithsonian Institute are the only ones whose manuscripts are currently being opened via Elsevier. Manuscripts for other partners will become available during 2017. No, The aim of CHORUS is to widen access, compliance, discovery and preservation of peer reviewed article. Anyone located in any country can freely access the content. Authors are increasingly being required to also make their research data open access alongside their published article. Will CHORUS also be used for research data? CHORUS is piloting a number of new initiatives to extend its services to institutions. Research data is something that is also being considered at this moment - although currently, there are no formal pilots.